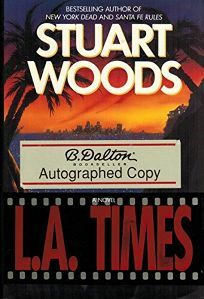 Prolific crime writer Woods is back in form with a propulsive thriller featuring a movie mogul embroiled in multiple murders. While his last effort, the disappointing Santa Fe Rules , had a similar plot trajectory, Woods succeeds here with the help of a dynamic protagonist whose ambitions fuel a wild ride and an explosive ending. Vincente Michaele Callabrese works as a shake-down artist for the mob in New York City's Little Italy, but moviegoing is his passion. Early in the story, he changes his name to Michael Vincent and makes a break for L.A., where with the help of powerful studio head Leo Goldman he fufills his dream of becoming a big-time producer. Vincent's cosa nostra connections keep in touch, particularly old pal Tommy Provenzano, whose rise to power in New York parallels Vincent's in Hollywood. Eventually, Vincent's desire to bring a gentle turn-of-the-century novel to the screen leads him to employ the sorts of techniques and friends that served him in his mafia days. Cinematic triumph follows, but so does trouble. After so much absorbing Hollywood intrigue, the mob-style violence of the novel's last chapters seems almost anti-climactic. Readers will have few complaints, however, having been eminently entertained by the abundant suspense Woods creates as he depicts this licentious, adulterous and violent milieu. 100,000 first printing; $200,000 ad/promo; author tour. (May) .